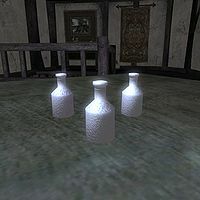 Skooma is an illegal narcotic drink/substance manufactured from refined Moon Sugar. Skooma is extremely addictive and banned by the Empire in some parts of Tamriel. Skooma is valuable and often smuggled, being used as a form of currency among criminals. Unlike in Morrowind, where law-abiding shopkeepers do not touch it, merchants in Cyrodiil will buy and sell skooma freely. Several skooma dealers can be found in and around Cyrodiil usually in hidden and out of sight spots, such as Shady Sam and Nordinor. A skooma den can also be found right above Carandial's house in Bravil. There is also a skooma smuggling ring led by Dulfish gro-Orum that can be uncovered in Cheydinhal through investigation by the player. Skooma never appears randomly, and most skooma does not respawn. Only the locked barrel outside Myvryna Arano's shack at the Waterfront has respawning skooma, which is then transported each week by Oghash gra-Magul to a hollowed-out rock by Walker Camp. Apart from this trade, the skooma vendors below have a respawning inventory. These vendors have respawning skooma in their merchant chests. You can purchase it from them, but you cannot obtain the skooma by pickpocketing. Unless stated otherwise the bottles are sitting out in the open. There is a total of 130 bottles of skooma. 10 bottles: In the locked barrel outside Myvryna Arano's House every Tirdas, as noted above. See Oghash gra-Magul's schedule for more details. This page was last modified on 12 April 2017, at 03:24.